Guiltless Getaways: Korean Film Festival 2012 Schedule, in Manila, Baguio and Cebu! 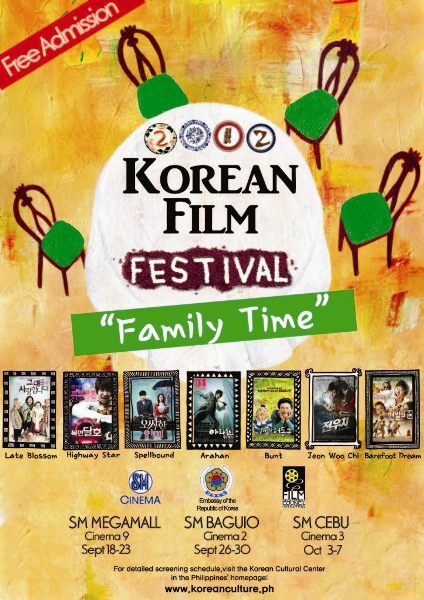 Korean Film Festival 2012 Schedule, in Manila, Baguio and Cebu! Have you watched any Cine Europa 15 film yet? It's time to start planning your schedule for the free movies you will watch next next week after this post! Click on this for the Cine Europa 15 Schedule. I just watched The Last Emperor last weekend and I highly recommend reading my tips on watching this year's Cine Europa Film Festival in order to secure yourselves a seat in this well-attended film festival in Manila. As I said before the Ber months signal the time for film festivals all over the Philippines and watching is a way to level up those movie dates into film appreciation marathons. This year's Korean Film Festival (2012) will be held in SM Megamall (yey!) from September 18 to 23, 2012 then in SM Baguio (new location added from last year!) from September 26 to September 30, 2012 and lastly in SM Cebu from October 3 to October 7, 2012! These are 7 family-themed top-grossing Korean films. Entrance is free. You need to get tickets at the entrance of the cinema. Ya! Ch'in-gu! I'll take you there through my posts on Korea and my DIY Korea trip itinerary in this blog! Korea is a wonderful country! Han-gu-gŭn dae-dan-han na-ra-im-ni-da. 한국은 대단한 나라입니다. Click here for a little more info on the film entries included in the Korean Film Festival 2012.